Updated from 9:33 a.m. EDT with economists' comments on the government's March nonfarm payroll report. NEW YORK ( TheStreet) -- The government said Friday that U.S. nonfarm payrolls increased by 120,000 in March while the unemployment rate fell to 8.2% from 8.3% in February. On average, economists surveyed by Briefing.com were expecting payrolls to increase by 200,000 and the unemployment rate to remain unchanged at 8.3%. The worse-than-expected payroll number boosted bonds but hurt stock futures. The Bureau of Labor Statistics said employment increased in manufacturing, food services and health care but fell in retail. Private-sector payrolls increased by 121,000, while government employment was virtually unchanged. The average workweek for private-sector employees slipped by 0.1 hour to 34.5 hours in March. Average hourly earnings rose by 5 cents, or 0.2%, to $23.39. Also Friday, the Bureau of Labor Statistics revised nonfarm payrolls for February upward to 240,000 from the previously reported 227,000. January's payrolls were revised lower, to 275,000 from 284,000. The U.S. stock market was closed in observance of Good Friday, but investors were clearly disappointed as stock futures fell. U.S. bond markets were open until noon EDT. At the CME, where futures traded until 9:15 a.m. EDT, Dow Jones Industrial Average futures closed down 131 points, or 1%, at 12,847 after hitting a low of 12,837. S&P 500 futures closed at 1375, down 15 points or 1.1%, after slumping as low as 1372.50. Treasury prices rose on the news, pushing yields lower. The yield on the benchmark 10-year Treasury fell to 2.05% from about 2.20% before the report was released. Economists acknowledged that the payrolls number was a disappointment, but some said it's likely a hiccup rather than a significant change in labor-market trends. Paul Ashworth, chief U.S. economist at Capital Economics, said the modest March increase was "payback" for gains in January and February due to unseasonably warm weather. "Admittedly, the payback is a little bigger than we had expected, but we don't think this is the start of another spring dip in labour market conditions as we saw in 2010 and 2011," Ashworth wrote in a research note. "Even factoring in the March disappointment, the three-month average gain is still 212,000 and we expect employment to continue rising at about that pace over the next few months." RDQ Economics noted that March's number must still go through two revisions and that other measures of employment have suggested the month's job growth was much stronger. 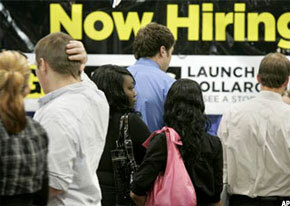 On Wednesday, Automatic Data Processing reported that private-sector jobs increased by 209,000 in March. The March number will generate enough uncertainty that the Federal Reserve policymakers will leave open their quantitative easing options at their April 25 meeting, wrote John Ryding and Conrad DeQuadros at RDQ Economics. But, they added, "this report, even taken at face value, is not a sign of weakness given the volatility in the data."